and so Tasty Bakes was born. Since officially launching in February 2011, we have had many quirky requests for bespoke cakes, with customers returning again and again. 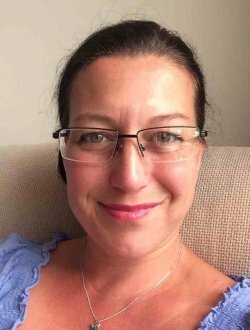 We have attended countless food fairs and farmers markets with our range of our cupcakes, macarons, muffins, tray bakes, slices, cookies, homemade fudge and chocolate goodies. We have had many requests for dairy free… gluten free… nut free… Rest assured that no “issue” is an issue. In 2014 we relocated from the North West of England to the stunning Fleurieu Peninsular, to the fantastic market town of Willunga, in South Australia, and we started all over again… Learning climate differences, trialling, re-perfecting our recipes and techniques, adapting accordingly – what a learning curve it has been! We have recently designed and installed a brand new custom-built kitchen and studio to further facilitate the provision of perfect results, and we look forward to working with you from our new base in Willunga. We source our ingredients locally, supporting local farmers and growers, and we bake everything from scratch. Our cakes and bakes are freshly made to order, or to buy directly from any of the events, fairs or markets we attend. We will never use wholesale, frozen, thawed, packet mix or ready-made cakes or other products. We use only free range eggs and natural flavourings where possible, including our homemade vanilla extract made using the finest grade AAA Madagascan Vanilla Pods. We are fully insured, we hold Food Handling Certification, and our kitchen is registered with Onkaparinga Council. 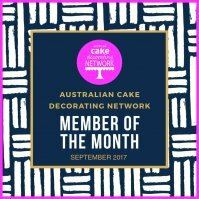 ACDN (the Australian Cake Decorating Network) – recently winning Member of the Month! 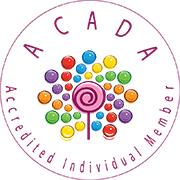 and ACADA (the Australian Cake Artists & Decorators Association). We are proud to be a Cake Maker that you can trust.